Pretty much everyone is familiar with open source software. However, the concept is transcending into other industries. Hence, we label this trend ‘The Open Source Economy’, an economy where organizations don’t design to protect (patent) but rather to spread (share). The idea behind open source is that someone can take an idea or design and develop it further – which in turn can lead to better solutions. Drupal is the most widely used open source web content management system. It is used as a back-end system for 1% of all websites worldwide. Drupal is behind complex websites such as whitehouse.gov; data.gov.uk and even Ebay. In addition companies deploy it for knowledge management and/or business collaboration. Telenet for instance, the largest provider of broadband cable services in Belgium, used Drupal to develop their knowledge base. Open source in other industries? Publishing – Open Source Magazine: The July and November issue of a South-African magazine “hip2b2” only consisted out of open source content licensed under a Creative Commons. Fashion – Open Source Fashion Label: A label for green and fair fashion items is open: other designers and artists are invited to enrich the label with their own creations. The label ensures that the product is high-quality and sustainable. Automotive – Open Source Eco-car: An open source project that aims to design the car of the future. More than 800 people collaborated on the car’s blueprints. Those blueprints are publicly available under an open source license. The new car is open for modification by others as long as any derived works are shared with the public as well. Food / Lifestyle / Leisure – Open Source Restaurant: At a restaurant in Amsterdam, everything starts with a web-based documentation platform. The web app allows people to share their with others and the restaurant deploys it for crowdsourcing basically for anything. What’s more, the instructions for creating a similar restaurant yourself are available online. How to “open source” your business? Open source seems a sustainable recipe for success. We’re not saying you have to comply with this trend but why not consider it at least? Is it also applicable to your activities? If you were to transform into an open source business, how would that affect your current workflow (a.k.a. cost structure)? What market advantages would you get from it? Would it result in a unique position that positively impacts your bottom line? Need ideas? Generate them with us. Just contact us, leave a comment, follow on twitter, etc. Facebook Questions to impact R&D? On Crowdsourcing. 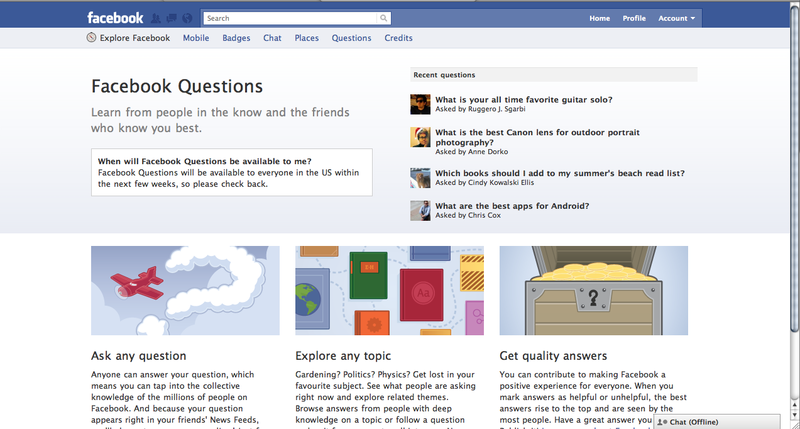 Facebook Questions will be available to everyone in the US within the next few weeks. Shall this impact the way enterprises handle R&D? Will this mean a boost for crowdsourcing? Can Facebook Questions and Facebook Groups improve business operations? Shall knowledge-workers deploy it to collaborate in an enterprise 2.0-style? Facebook Questions' impact on R&D: crowdsourcing over Facebook? Corporations can rely upon the knowledge available through every Facebook user. And that’s a lot: more than 500 million active users. Without a doubt, one can find creative solutions for any challenge by addressing this “melting pot of knowledge” named Facebook Questions. Enterprises can drastically cut their R&D expenses by using the “free knowledge base”. But what’s more, by developing products in co-operation with the external world, the success rate of bringing it to the market increases. The logic: co-creation results in a solution that better matches the problems. The consequences for individuals are both negative and positive. Individuals have the opportunity to present themselves to tackle global challenges. On the other hand, competition among individuals gets tougher because of the global scale of the resources. In the end this results in better products. After all, the fiercer competition the better the result.